Every once in a while, the stars align and something truly great happens. PIPA has been lucky of late - lots of exciting news! 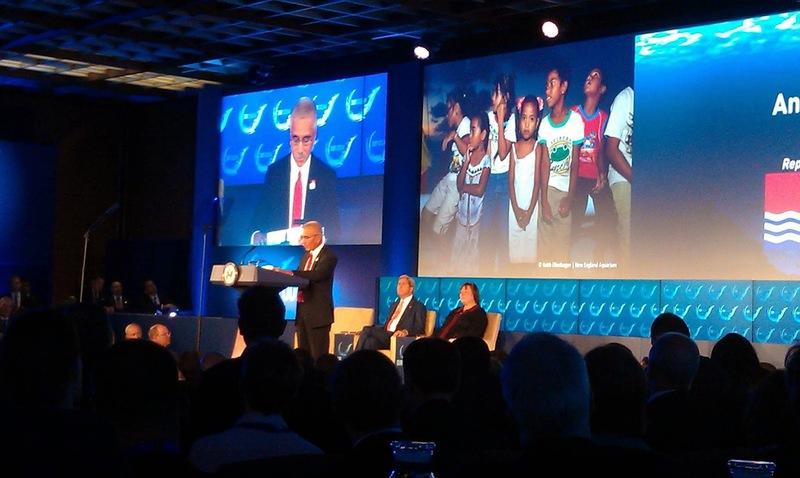 His Excellency President Anote Tong recently announced to the world that the Phoenix Islands Protected Area (PIPA) will be closed to commercial fishing as of Jan 1, 2015 at the Our Oceans conference, hosted by U.S. Secretary of State John Kerry and the U.S. State Department, Washington, DC. This is especially exciting because it means that the previous posts on this blog (about tuna) are now out of date. Very soon, tuna fishing will not be allowed anywhere within PIPA waters. The only fishing that will be allowed will be around Kanton Island, which currently is (and will remain) a sustainable use zone, to allow the caretaker population (roughly 35 people) to fish for protein. This is absolutely necessary, since supply ships to PIPA are irregular and rare. Simultaneously, we were lucky enough to be welcoming two Kiribati colleagues (Tekeua Auatabu—from Christmas Island, and Iannang Teaioro—from Tarawa) to the U.S. to begin a 2-week course at the Sea Education Association (SEA) in Falmouth, MA, along with 13 students. Of course, they also visited the New England Aquarium, where we have several mentions of the Phoenix Islands Protected Area on exhibit! (Here's one of them....). Two weeks on Cape Cod may sound fairly idyllic, but everyone was working really hard to get up to speed on their upcoming adventure. All-day, every-day coursework, lectures, guest-lectures, and sail training (with only a 1-day break)... and on the last day, everyone was still smiling! Within a day, the whole class will set sail from Honolulu, where they will spend 6 weeks at sea en route to the Phoenix Islands. 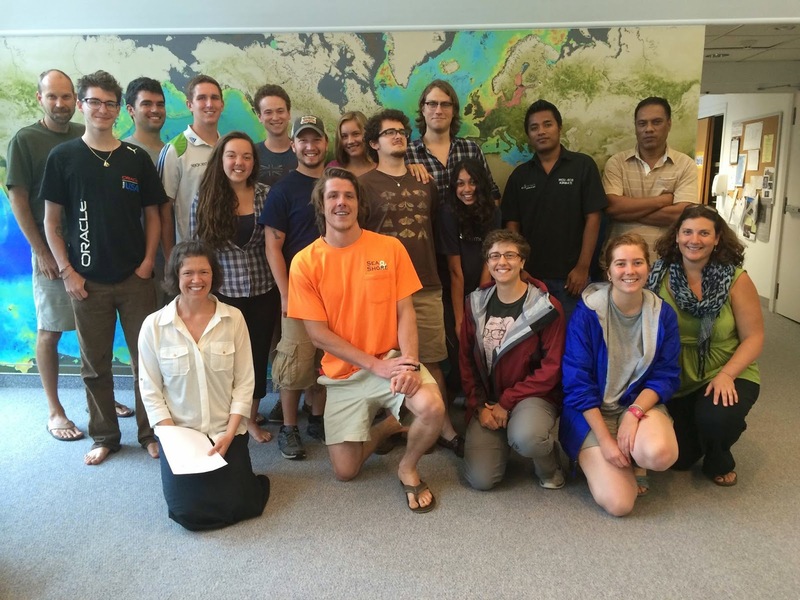 This will mark the first-ever oceanographic cruise to PIPA, and is a historic collaboration between SEA, the New England Aquarium, Woods Hole Oceanographic Institution, and of course: the Republic of Kiribati. The objectives of this mission are multi-fold and many, but include first and foremost the high quality education of 13 students in both science and policy aspects of PIPA and related regions. The scientific goals of the sea portion will be detailed in the coming weeks and months, and will be chronicled here on this blog. But already, the adventure had begun. For example, a PVC hand-off in Beacon Hill (Boston, MA) between Cam Braun (WHOI), Randi Rotjan (New England Aquarium, not shown), Tekeua and Iannang. Why the PVC? Excellent question! The answer: there are no hardware stores in the Phoenix Islands. :-) But more specifically, the PVC pieces are cut to a very specific length so that we can take photos of the reef floor from a fixed distance (photoquadrats) that will be analyzed later for species diversity, composition, density, cover, and health status. Given that we are headed towards an El Nino year, it is important to get as much documentation of PIPA reefs before, during, and after any potential ocean warming (and perhaps bleaching). Until then, the students, scientists, and crew are all gathering in Honolulu, getting oriented on-board, and double checking that all necessary supplies are in place. If the stars aligned, and I think they are, then: to sea! With SEA! To see!